In this lecture, Steiner gives many great examples of teaching geography. And he then extrapolates from that some very important distinctions about teaching all subjects. Before I describe Steiner’s pointers on teaching geography (which is a great subject to teach with multiple ages, by the way), I want to be sure that you read this quote thoroughly. Read it and re-read it if you must! It is not laid down for you that you have to teach geography from the ninth to the tenth year; instead you are left free to decide when the time is ripe to fit geography in with whatever else you have been doing. 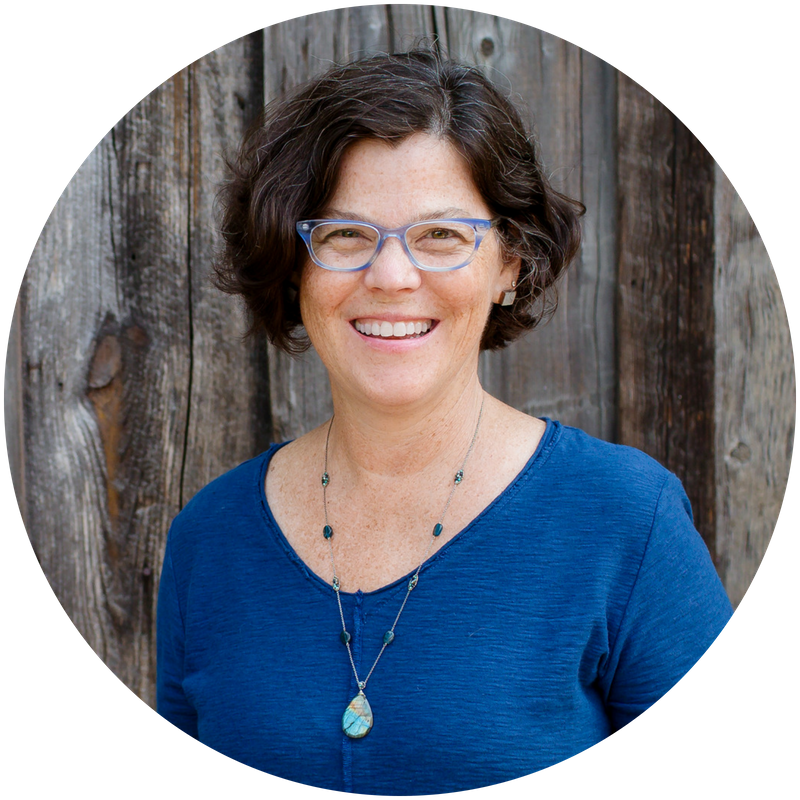 What does that mean for us as homeschoolers? That we must decide when it is best to bring the different subjects to our children. So rather than follow a Waldorf school’s specific timetable for curriculum, I find it more suitable for homeschoolers to follow the more general outline from Steiner himself that he presented in Lecture Ten of his lectures to the first group of Waldorf teachers: The Three Stages of the Waldorf Curriculum. In that lecture, Steiner lists subjects to be brought in three year time frames; for example, the list for up to the 9th year is this: music, drawing, painting, writing then reading, foreign languages, arithmetic (starting with geometric forms). Ok, so that’s the major message of this lecture. 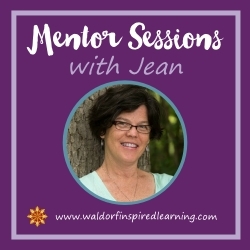 You are your child’s teacher, and you decide when to bring what subjects. This means we can wear this curriculum a bit more loosely than we originally might have thought! Now on to geography, which is generally brought after the ninth year. Although Steiner makes an interesting point in this lecture; he says that a subject can be woven in in a narrative way in the stage prior to when it’s brought more directly. Here, I’m picturing our youngers listening in on the stories that the olders are then working on more in depth. Now, geography. The starting point for geography is what the child knows, which is his or her neighborhood. We begin by creating a map of the neighborhood and work to change the point of view from being in the neighborhood, to seeing it from outside, from above looking down. We work with the children to transform the landscape into a map, first adding in earth features such as rivers, streams, and hills. We use color to represent these things. And then add vegetation including forests, meadows, parks. Steiner suggests drawing little iconic images to represent these different elements, just like you would see on a map key. We then venture into the economic aspects that humans have added such as canals, railways, roads. In this way, we show the links between the natural environment and how humans live in a particular place. And so we expand to the region, the state, or country. This is different for each of us, depending on where we live! 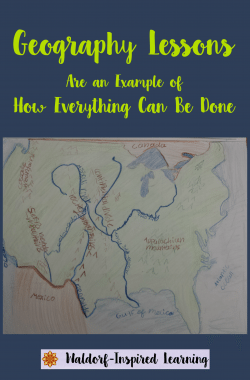 For my family, our major geographic features include rivers that flow into the Great Lakes. And the city where we live was first settled at one of those intersections of river and lake. In Steiner’s lecture, he uses the Alps as the example and the major geographic feature for teachers to explore in that first Waldorf School in Stuttgart, Germany. He then goes on to describe the introduction of mountains and villages and valleys, describing how we want to give children a picture of this interaction between humans and the natural resources of the land we live on. He describes the soil and rocks and crops that might grow. And the agricultural inventions. When you are telling the children about the links between agriculture and mans way of life, do not miss the opportunity of giving them a clear picture of a plough and a harrow in connection with the geographical picture. Let them also imitate some of the things you tell them, perhaps in the form of a little plaything or a piece of artistic work. This will give them skills and will fit them for taking their places properly in life later on. And if you could even make little ploughs and let them cultivate the school garden, if they could be allowed to cut with small sickles or mow with small scythes, this would establish a good contact with life. Far more important than dexterity is the soul contact made between the life of the child and the life of the world. Such rich ideas here. And as I look back on my three children and our exploration of geography, starting with our local area, I remember with fondness as do they our canoe trips on the lake, our visits to Kelley’s Island to see the glacial grooves (glaciers formed these great lakes), our hikes in Ledges Park, and exploring creek beds. And I can tell you for certain that this didn’t all happen within the confines of a 4th grade Geography block for each of them! But that doesn’t make the experiences or the learning count any less. Alison and I have a very special treat for you here, a sample geography block that Alison put together: Sample Block- North American Geography. Such a block might typically be done in the 5th grade, but it’s certainly a block that you could do with the whole family as a multi-age experience. And really, anywhere from 5th to 8th grade, after explore your local geography first. Keep in mind: this block description is meant to be loose! Remember this concept of “your are left free to decide when the time is ripe to fit geography in with whatever else you have been doing”? Straight form Steiner’s mouth! You are also left free to decide which things to include and which to leave out. 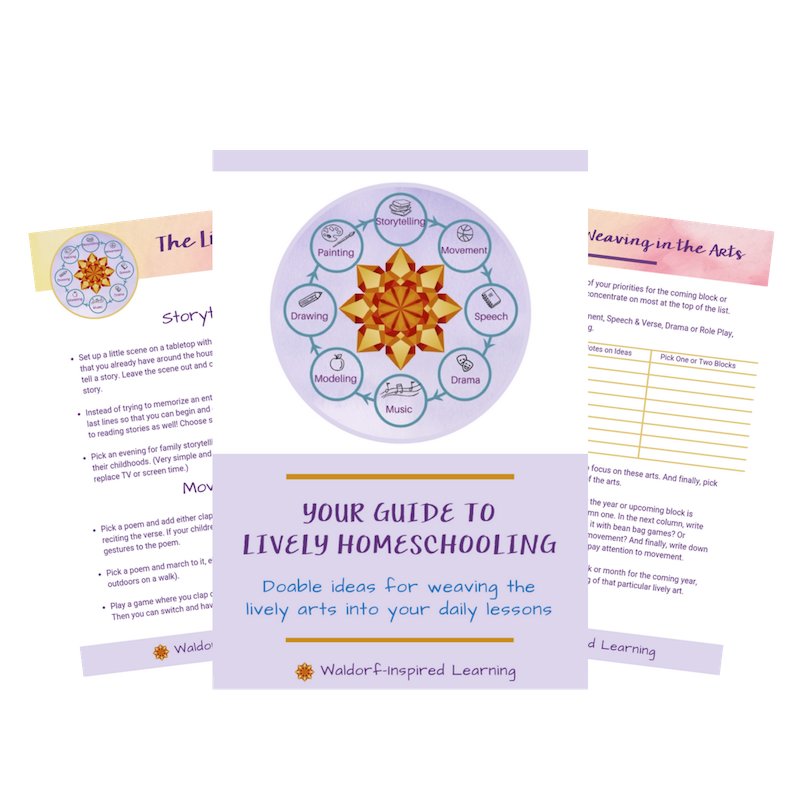 Find ways to weave all of your studies together in your homeschooling. Enjoy and please do share with us if you use this sample block! I will close with the final paragraph from the lecture that brings us back to my idea of wearing this curriculum a bit more loosely. We can do a tremendous amount in this direction if we do not have to start with a timetable that is laid down with military precision but can proceed in accordance with what arises out of the lessons. But we must have a good idea of what is required by the children in the different stages of their development from the time they start school up to their ninth year, from their ninth to their twelfth year, and from their twelfth to their fifteenth year. 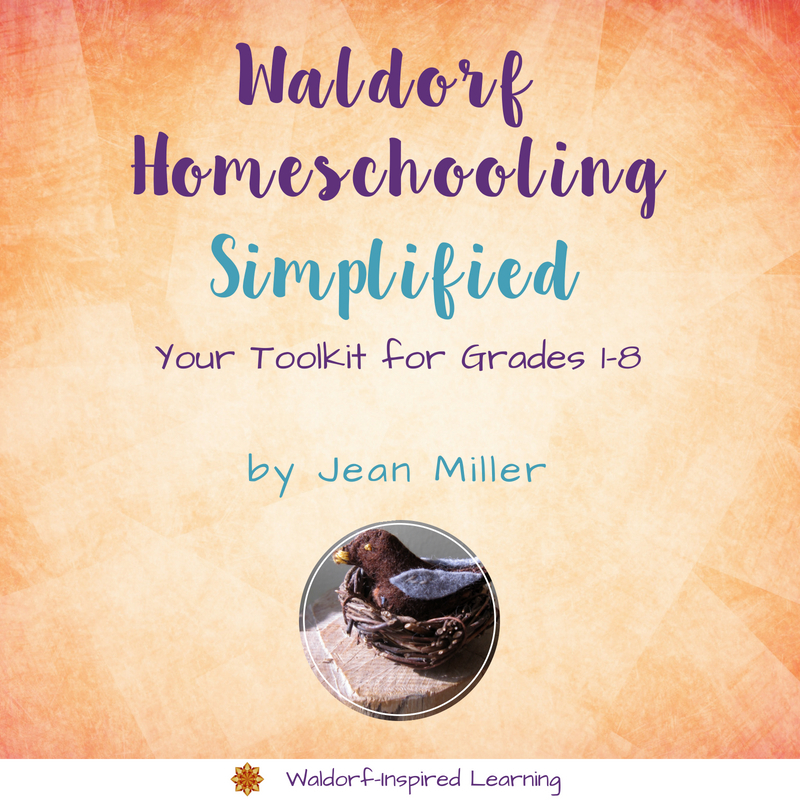 Does reading about this lecture change how you view Waldorf homeschooling? Please share! If you prefer, you can read online at www.rsarchive.org, or listen at www.rudolfsteineraudio.com. 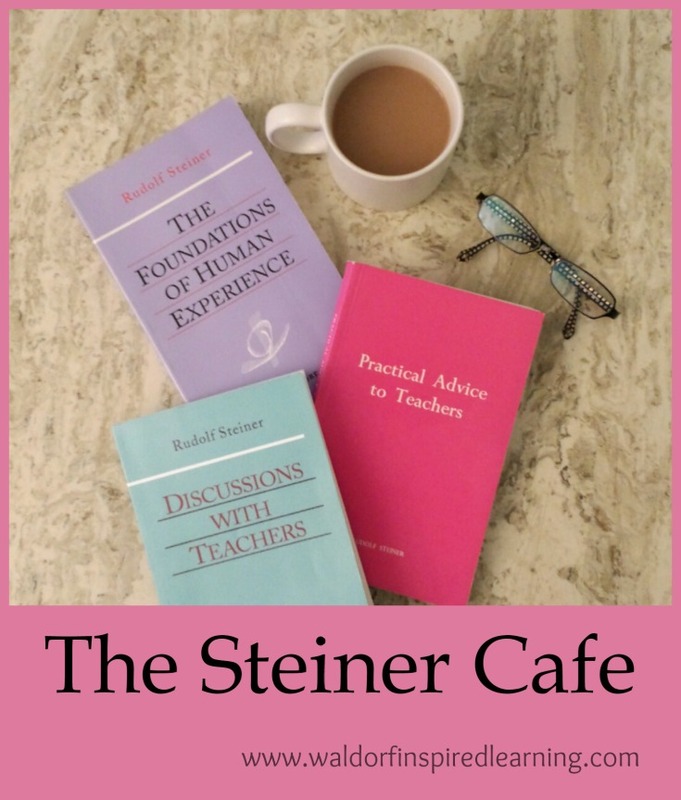 Or, just meet us here each Thursday or Friday at The Steiner Cafe for some lively discussion. Lot’s of options! This is great!!! I love the book list in the ML Block! Thanks, Barbara! I woke up thinking about this Waldorf phrase: “Education toward freedom.” And I think we need to include freedom for ourselves as Moms, as well! Doesn’t do anyone any good for us to be tense and stressed and sleep deprived from trying to replicate some perfect lesson plan that doesn’t even exist!!! Yes, Barbara, you have been such an inspiration to us both! And to us book lovers, who really love “couch time,” we thank you for passing on your great book lists! Yes, this discussion does make homeschooling seem easier. I do get a little stuck on the school curriculum and that we have to be in line with that, but the further we go with homeschooling (we’re currently in 3rd & 4th grade) I am becoming more confident to wait if something doesn’t seem to be going so well, or move forward if there’s a lot of interest. I also feel that I’m referring much more to Steiner’s actual directives rather than the Waldorf School “traditions”. 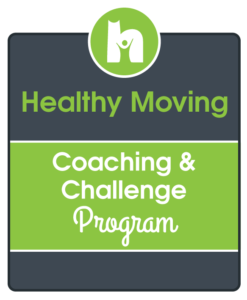 Thank you for your all your great information and support! Thank you for your comment, Ruth! I think we all get a little stuck on the school curriculum at different points on our journey. It’s brilliant that Steiner left the curriculum somewhat open, however, because we do need the flexibility to adapt to our own families and situations! I love that reading Steiner himself gives us more of a sense of freedom. The message in this post and your rhythm post are speaking clearly to where I am right now in our homeschooling. 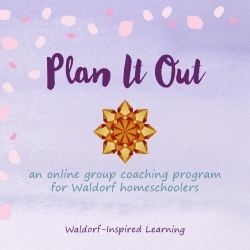 I have just come, on my own, to a place in my homeschooling where I have accepted that my timetable for the children in my charge isn’t following “the” Waldorf timetable, so it is incredibly validating to envision Steiner nodding approval at me. Thank you for the N. American block link! A nod from Steiner! Love that image. So good to know that “the” timetable is not set in stone. I love Steiner’s discussions about how stifling fixed timetables can be. Nicola, thanks for commenting, and glad you’re finding the geography block helpful.